1. I bring my needs to Jesus. It may sound simple, but often, when we have a need, we don’t bring it to Jesus. We try to take control and meet our need ourselves. After becoming overwhelmed, disappointed, and disillusioned, we bring our need to Jesus. There’s nothing wrong with sharing a need with others or actively looking for a solution. But before you do anything, bring your need to Jesus and let Him guide you. What if, when we had a need, we went to God first as our first instinct? Jesus loves us, understands what our needs are and wants to meet them. Whatever your need, health, relationship, bring your need to Jesus first, and trust Him (Psalm 55:22). 2. I remain thankful to Jesus during my time of need. It’s easy to be thankful when everything is going your way, but when your money is running out, when the business is going down, it isn’t easy to be thankful. The Bible says it’s most important to be thankful, during your time of need (1 Thessalonians 5:18). IN all circumstances, not for all circumstances. We must realize that despite the trouble we’re facing, we always have something to be thankful for. When we’re thankful for what we do have, God steps in, He gives peace, strength, and gives the help that’s needed. 3. I keep bringing my needs to Him. Remember, Jesus promises that if we trust Him, He will provide for our needs. Sometimes God doesn’t meet our needs the way that we expect Him to on our timetable, but He always meets them when we trust Him. Keep on asking (Luke 11:9) until God says, ‘I will not answer that prayer!’ When we keep bringing our needs to Jesus, we prove that we are relying on Him. The apostle Paul had a need he went to God about. God didn’t answer his prayer the way Paul requested, but God answered by giving him grace to endure (2 Corinthians 12:7-9). You may have asked God to provide for a need, He hasn’t yet, and you’re discouraged. But Jesus says, “Keep asking. Keep being persistent.” Even if you don’t get what you want, trust that God is always going to give you what you need. 4. I celebrate when Jesus meets my needs. Celebrate. Be thankful. Acknowledge that it was Jesus who just met your need. Too many times we come to Jesus for a need, then we forget to come back to Him and celebrate with Him when He meets that need in our life. Celebrate what Jesus has done in your life! 5. I offer my entire life to Jesus. When I don’t trust Jesus, and I hold back areas of my life from Him, I don’t receive God’s blessing. I end up frustrated and don’t receive God’s best for my life. Whatever you offer to Him, He blesses (Mark 8:35). 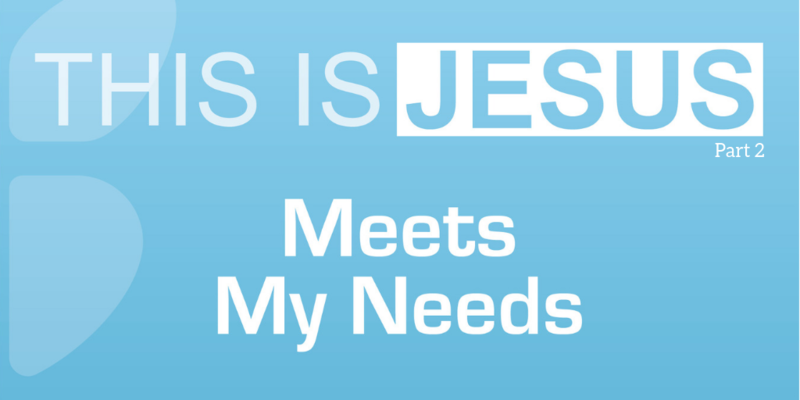 Jesus came into the world to meet our needs. Our physical needs: if He fed the 5,000 and healed the lepers, He will do the same for us today. Our need to be loved: Jesus gave His life for you on the cross. And He created the church as a family that you can enjoy, and experience healthy relationships with. Our need to make a difference: Jesus is the one who gives you a mission and a purpose to live so you can have a fulfilling life. Our need to be secure: As a Christian, you belong to Him, and no one can ever rip you out of His hands. Your eternity in heaven is secure. Whatever need you have today, bring it to Jesus and be thankful. Give your entire life to Him and He will give you everything you need (Matthew 6:33). If Jesus is MASTER, then He can meet all your needs.